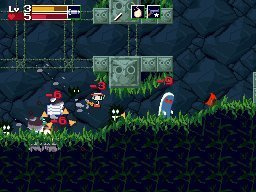 The announcement that Cave Story is coming to DSiWare was pretty awesome news all around, and now we have the first footage of the game in motion to share with you. We'll also be bringing you more exclusive screenshots in the near future so check back soon for more Cave Story DSiWare coverage. wait.... during one part i saw one of balrogs lines.... WHERE IS THE HUZZAH!?!?!?!? HE SAID OH YEAH!!!!!!! HES BALROG, NOT THE KOOL-AID GUY! I know I say this all the time, but why can't I view videos on NL, but I can on other websites? Use the bottom screen! How hard is it to put a map, some gameplay stats, or something worthwhile down there? It's such an opportunity to be creative, and yet most devs fail to use it. I'm starting to think they simply don't want to release this in the EU. It can't be laziness, not when the game is already done and bugs are fixed and they even have time to make a DSiWare version. There are Europeans sitting with their wallets ready, willing to pay for a game that's free for download on the net ffs; what other reasons could there be? Cool trailer! Don't make us wait too long, Nicalis! Yeah, I know! I actually could have sworn that they said they were going to use the bottom screen for a map, but I guess I was wrong. The screenshots show the bottom screen used for a map and inventory. @Axoloth The European release date for this game is nothing to do with Nicalis. Nintendo of Europe assigns release dates, and comments like "they don't want to release this in the EU" are just daft, tbh. Of course they want to release it but it's out of their hands. @warioswoods They said the map will be placed on the bottom screen. They probably removed it for the sake of the trailer. Considering NoE's release schedule doesn't include Cave Story, Shantae or BIT.TRIP, I think they really need to get their act together. Is it fate that we're always getting the short end of the stick? I see, thanks for pointing that out. I don't see why the trailer blanked out the bottom screen, but I'm not longer concerned after looking at those screenshots. This one of the few DSiWare games I'd like to play. Cave Story is perfect for a handheld. Still don't know why they refuse to add back in "huzzah!"... It's such a simple fix, Balrog has been pretty much recognized by it from the original english translation, and it's something I know a lot of fans were kinda ticked at Nicalis about when they changed it for the Wii version. "Oh yeeeah!" just seems way to cheesy to me... I know it shouldn't matter too much, but for me personally, it just took away a little part of what made Cave Story (and Balrog in particular) really hilarious, and replaces it with a lame Kool-Aid reference. Instead of getting excited for his in-game appearances like I used to, I now just kinda groan when playing the Wii version. Definitely has left a slightly bitter taste in my mouth, but I guess there is nothing I can do other than complain/rant about it on the internet! Oh well. They uh... forgot to use the bottom screen. Didn't they say it was going to be released before Halloween? @19 *Hopefully going to be released before Halloween. This trailer makes me think soon after, though. Looks good, but a bit hard to see. I'll still be picking it up for sure, though. And then the end of the trailer explodes into a sound boom of pain. Wish whoever's behind the delay in releasing this in Europe would sort it out because I'm coming close to just downloading the freeware version now. Trailer looks good. Still waiting on a price point and a release date (I have 800 points left...and Zenonia looks tempting right now). You took the words right out of my mouth, lol. Nicalis ARE working to get CaveStory out in Europe. Last twitter is about them await the final go-ahead from NOE.